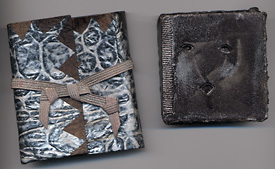 For available books in these series: artist's books catalog. Painted Faces is about the changing perceptions of spirits and their significance in human culture. I began the books after I returned from New Guinea inspired by the clan carvings of the Sepik River villages and the body art of the Highlands tribes. Each miniature book is a signed, unique variant in its series. Nightfall Faces are the unnamed dark and light spirits of forest and bush. The rattle suggests the spooky sound of unknown spirits passing by in the night. Primary Faces are the named, primal, ancestral spirits of the village. The rattle becomes the rattle of the masked and painted spirit dancers in the clan houses. Harlequin Faces are the festive, carnival faces of town. The folk spirits are not completely forgotten. The rattle is the sound of the carnival, but also the sound of something again unnamed and still passing through the back alleys and streets. Figure 1: Primary Faces wear the primal primary colors of red, blue and yellow. Figure 2: Harlequin Faces celebrate the complementary "store-bought" colors of yellow-purple, red-green and blue-orange. Figure 3: Nightfall Faces glow from the blacks, whites and silvers of night. All papers are acid free. Additional materials include Tyvek hinges, Ph-neutral PVA glue, Golden and Daniel Smith acrylics, plus a final coat of Renaissance Wax on the book pages. The "rattle" is made from buckshot. Books: 5 pages, 3 x 3 x 3/4 inches (7.5 x 7.5 x 1.5 cm) Packet wraps: 3 3/4 x 3 1/2 (9.5 x 9 cm) opening to 3 3/4 x 8 1/4 inches (9.5 x 21 cm) with a silver ribbon slipknot tie. For available books in this series go to my artist's books catalog. Figure 4: Painted Faces: cover and packet wrap. The wrapping is modeled after wraps made in New Guinea to protect kina shell jewelry and other valuables between ceremonial displays.